The Rockville BPA10 10” powered PA speaker has superior sound quality and power to anything at this price point. At Rockville we cut out all the middle men and deliver the best professional products at the best prices. This speaker has an incredible 400 watts of peak power and will deliver a massive amount of highs, mids, and Bass. This speaker is super-efficient. The built in USB input and SD input are great options for playing back your music. The Bluetooth integration is very easy to use and is very reliable. You will be able to transmit music form your Bluetooth phone or MP3 player to play back on the speaker. The Bluetooth range is 32 feet. Our new Bluetooth chipset ensures top of the line sound quality so you get distortion free playback. This BPA10 speaker comes to the market as a result of one full year of intensive research and development. Our strategy used to be to re-sell other brands Bluetooth speakers at great price points. However, our customers were simply not happy with how loud they were able to go. As a result we had to stop carrying those other models. Since realizing there was a market, we decided to go out and try to make a better product and keep the price point the same. Like we always do, we went out and bought 5 models of great sounding PA speakers and put our engineers, purchasers, and designers to work to see if we can build something as good as the higher end brands for the price of the cheaper ones. One year later the BPA series was born and is now in stock! These go louder than the ones we tested against. We abused them for months and they still held up just fine! These speakers are true professional quality! 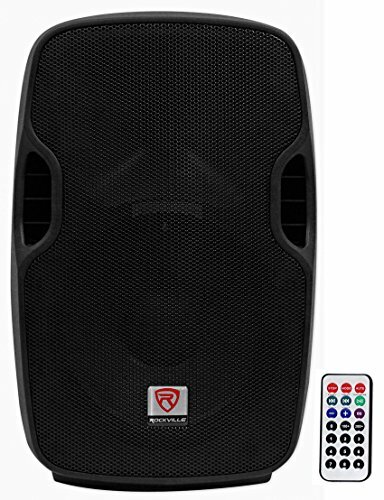 Rockville BPA10 10" 300 Watt Active DJ/PA Speaker With Built In Bluetooth. 400 Watts Peak/200 Watts Program/100 Watts RMS. High power long-throw 10'' woofer with 1.5" KSV voice coil provides incredibly deep bass and acoustic power. Frequency Response: 20Hz-20KHz. Maximum SPL @1w/1m: 102dB peak / 100dB continuous. Bluetooth signal input. Now you can input any audio signal from your Bluetooth enabled music player or phone. No cables necessary! Bluetooth range is 32 feet. USB/SD digital MP3 music player. Channel 1 features XLR and 1/4" TRS" inputs with volume control. Input audio signals, special effects, any preprogrammed audio file and amplify it through your system. Wireless remote control. Enjoy the added convenience of being able to adjust any of the MP3 player functions, including volume, from the included wireless remote. Channel 2 features RCA, and 1/8" aux inputs with volume controll. XLR line output for connecting to additional powered speakers, a mixer, or a powered subwoofer. LED screen displays MP3 functions including BT connectivity. High-power 2-way pro sound reinforcement speaker system for live sound and playback applications. Built In 2 band equalizer to adjust high and low frequencies independently. Compact and light weight system delivers distortion free sound even at extreme SPL. Linear Class AB amplifier technology: high power, transparent sonic performance. State-of-the-art 1'' pure titanium-diaphragm compression driver for crystal clear high-frequency reproduction. Ultra-wide dispersion, 45° large-format horizontal wave guide horn molded directly into cabinet. Versatile trapezoidal enclosure design allows different positioning. Built In high quality crossover to filter out unwanted frequencies. High-quality components and exceptionally rugged high impact ABS construction. Amplifier clip limit LED indicator & power LED cabinet rear. Built In FM Radio With 10 Presets and US/European Tunin. 110 / 220 Volt switchable power supply with external user serviceable fusing. Item Actual Dimensions in inches: 12.41" Length x 11.5" Width x 19.31" Height. Item actual weight: 18.48 LBS. Shipping Dimensions in inches: 13.99" Length x 11.5" Width x 19.31" Height. Shipping Weight: 20.46 LBS.